A subtle, subdued song built around common tones between chromatically moving chords. 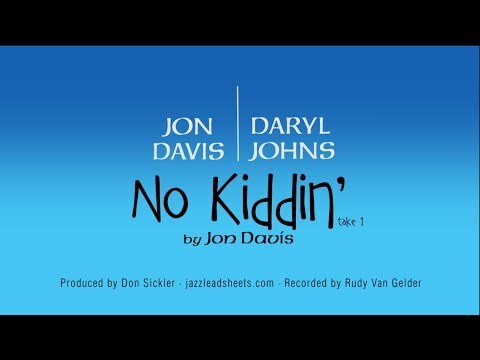 The first recording is Jon's duo version with bassist Daryl Johns, exclusively available on jazzleadsheets.com. Jon did two other recordings of this song, with slightly different arrangements. One of the pleasures of listening to jazz is to become aware of the sometimes subtle, sometimes obvious, differences in performances. It's improvisation after all, and the performers are completely "in the moment," acutely aware of each other and of the melodies, harmonies and form of their creation. These duo performances provide a nice opportunity to get into that space with the musicians. Check out the videos above. The performances were both so good, yet different, we wanted you to experience both. This subtle song has no key center. It has a cyclic form, with the end of the chorus resolving to the beginning; the form consists of two 24-measure sections. The melodic and harmonic structures focus on common tones between chromatically shifting chords. For example, the melody note B♭ is held through most of the first four measures, over chords that rise in half steps from B major. D♭ in the melody is carried over from E♭m7 in the 12th measure of the A section to Dmaj7 in the 13th measure, while F♯ in the melody connects Em7, E♭m7, and Em7 again in the 10th through 13th measures of the B section. A subtle 3-part counterpoint is present in the first eight measures: the melody is mostly static, moving down a whole step in the second four measures; the bass line rises chromatically but also moves down a whole step in the same place, and a countermelody (one note per measure, like the bass line) rises chromatically for six measures. The first 10 measures of the B section are largely the same as those of the A section, a half step higher. The last eight measures shift the common-tone concept to the bass, alternating Cmaj7 and C7(♯9) for two measures each. This "pedal point" section is vamped as a coda. Two takes of No Kiddin' were recorded at this session; a duo transcription is available for the in head of both, as well as lead sheets for every instrument. The transcription shows all the bass lines and the piano melody and notable countermelodies; it does not show the full piano voicings. The melody in the 9th and 10th measures of the A section is doubled by the bass in this arrangement. There is a C lead sheet for piano; it shows Jon's countermelodies for the melody. Jon hadn't decided on a title for this composition when it was recorded at the 2011 session. Later, No Kiddin' seemed appropriate; the "kid" (young Daryl Johns) didn't play like a kid, and the duo performance definitely rated a "No Kiddin'!" response. Along with lead sheets, a melody transcription is available for the in head of this trio recording. As he often does, Jon interprets his melody slightly differently. This arrangement does not have the bass doubling the piano melody in the 9th and 10th measures. However, a rising figure is added in the 11th and 12th measures of the B section, played by piano left hand and bass in unison. Jon's fills at the end of the head are similar to those in the first take of the original duo version (see left album cover). This tri-continental trio album also includes two more songs that Jon had previously recorded for jazzleadsheets.com with Daryl Johns: One Up Front and This Joker's A Smoker . A slightly faster duo version; it's interesting to compare Gianluca Renzi's bass lines with Daryl Johns' in the original duo setting. The bass rhythms are a lot simpler here, as shown below the staff in our melody transcription. The bass again doubles the melody in the 9th and 10th measures as well as the left-hand figure in the 11th and 12th measures of the B section. In addition the 20th measure of the A section also has the bass doubling the melody. Jon plays similar fills at the end of the head to the trio version and the first take of the original duo version. In addition to this duo album (check out This Joker's A Smoker for another track from "No Kiddin'"), Jon Davis and Gianluca Renzi also recorded in a trio setting, on drummer Lale Nenadovic's 2013 album "Counterpoint Interception." This trio album contains a version of Waltz For J.D., first recorded by jazzleadsheets.com. One other recording featuring Jon and Gianluca is trumpeter Dave Nelson's 2010 album "Missing - Jazz With Meaning".